Making false statements while testifying during a hearing in open court is the most obvious form of perjury. This blatant form of perjury would be most likely to result in criminal prosecution. 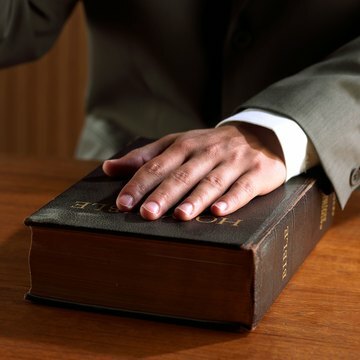 Testimony is also given during depositions in many divorce cases. In a deposition, a person is sworn in by a court reporter and must answer questions under oath from the opposing attorney. If you lie during a deposition, you are committing perjury. Perjury goes beyond false testimony in a trial. Presenting false information in any document sworn to under oath constitutes perjury. The state of Georgia requires that all initial divorce complaints be verified by the person filing for divorce. The verification is a document attached to the pleadings in which you swear under oath that the statements in the complaint are true, and it must be notarized. Whenever you sign something before a notary, you are swearing under oath that your statements are true. If you sign a financial declaration or affidavit that contains false information, you are committing perjury. Discovery is the process of gathering information from the other side in complicated divorce cases. Georgia allows three forms of written discovery. Interrogatories are written questions from your spouse that you must answer under oath, also in writing. Requests to Produce are requests for documents concerning the case, such as bank statements or phone records. Requests to Admit are when your spouse asks you to admit certain statements. Giving false answers during the discovery process is another form of perjury. Although it is unlikely that you will be prosecuted for committing perjury in family court, making false claims can seriously damage your divorce case if the truth comes out. Your credibility will be damaged and it will be hard to convince a judge to see your side of the issues. Once a judge knows that you have lied, all of your testimony is suspect. As a result, you could pay for the lie by losing in the property settlement. The best way to deal with compromising information is to tell your attorney the truth about everything. Your attorney will be able to guide you in dealing with the tough questions as they arise.